Our new Brisbane kitchen is ready to register regular and corporate volunteers. Help power the biggest charity kitchen in the Southern Hemisphere. Whether you are an individual or part of workplace team, we need your support. 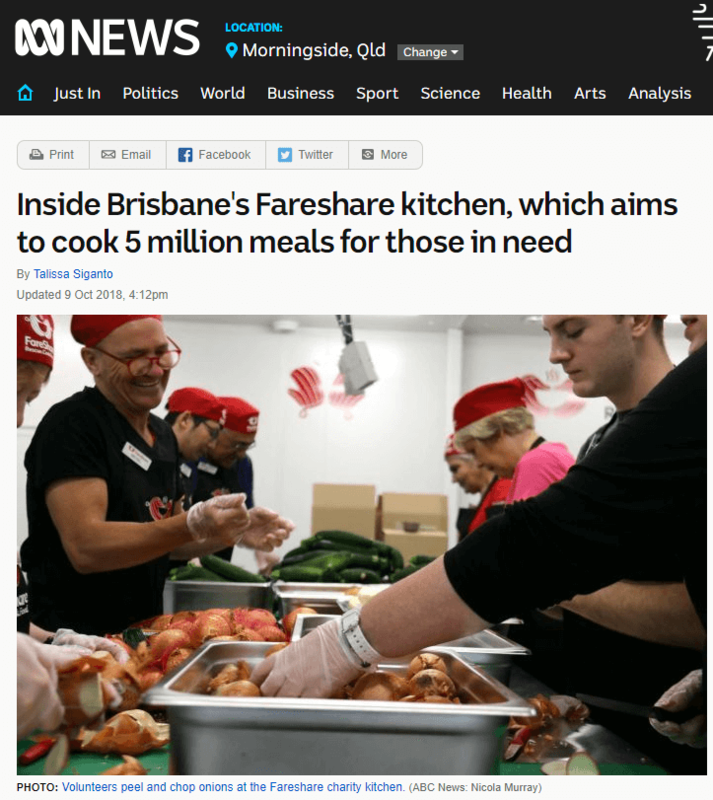 It costs FareShare Brisbane just 50 cents to cook a nutritious meal for someone in need. Every meal makes a difference and every donation means more meals. Powered by volunteers and supplied with surplus food by Foodbank Queensland, we aim to cook 1.25 million meals in the first 12 months. Sign up now and help us feed people in need with nutritious meals. Our new Brisbane kitchen is ready to register corporate volunteers. FareShare offers a unique and meaningful team-building experience cooking meals for people in need. 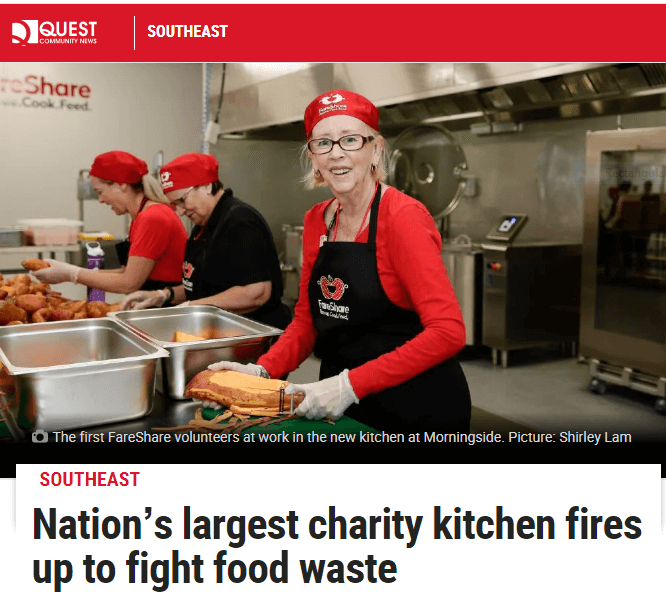 FareShare’s Brisbane kitchen has been designed to cook meals at scale with quality ingredients supplied by Foodbank Queensland. The huge kitchen – approximately the size of a basketball court – is equipped with industrial scale food processing tools including 300 litre electric saucepans which cook 750 meals at a time. 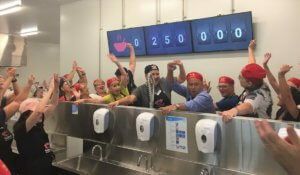 The multi-million dollar facility powered by volunteers aims to cook 1.25 million meals for vulnerable Queenslanders in its first year of operation and scale up to five million meals a year. Wiping tears from their eyes, volunteers surround a bench furiously peeling and chopping onions as they come in by the bagful. It isn’t easy work but there are no complaints in this basketball court-sized kitchen, which turns surplus food into free healthy meals for people in need around Queensland. Inside a commercial kitchen the size of a basketball court in Morningside, a team of volunteers is scurrying to chop, peel and cook 5000 meals each day for people in need. 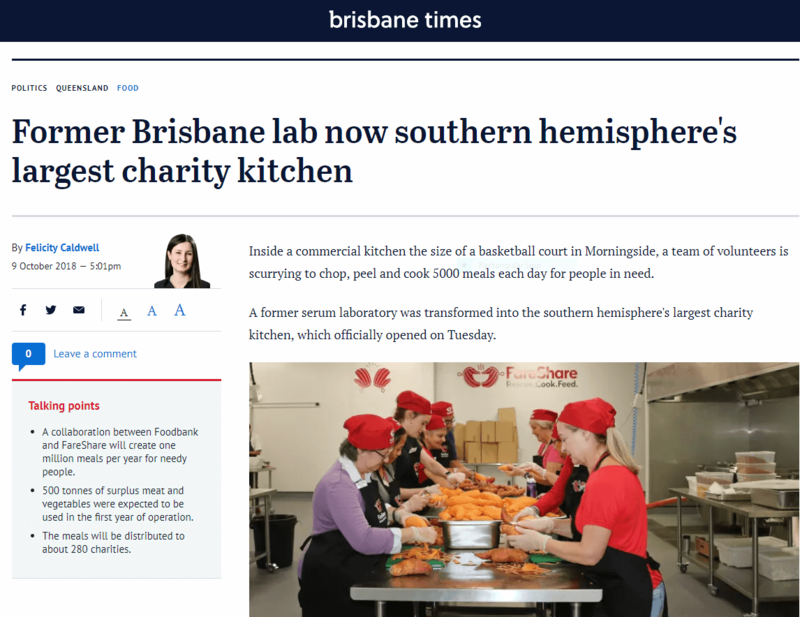 A former serum laboratory was transformed into the southern hemisphere’s largest charity kitchen, which officially opened on Tuesday. THE country’s largest charity kitchen has opened in Morningside with a grand plan to cook more than one million meals in its first year of operation and to scale up to five million meals a year. FareShare cooks surplus food into free, nutritious meals for people in need. 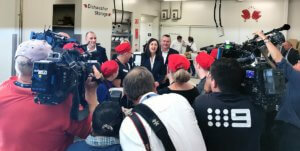 After 17 years in Melbourne, where close to 1000 volunteers help cook 1.2 million free meals a year, Fareshare is now opening its second kitchen in Brisbane.